With the Ducks sitting atop the NHL's Western Conference standings and the Devils still fighting for a playoff spot in the East, we were sure to see some good action. After a few exciting goals, one particularly nifty cross-crease assist from the NHL's second oldest active player, Jaromír Jágr, the game went to overtime and was eventually won with an old fashioned goal by Anaheim, who wore their road white jerseys. From a design studio's perspective it was good to see the Ducks identity and their Orange County roots represented so well by their fans at a New Jersey venue. We loved to see such a good turnout of licensed merchandise on hand to celebrate the Ducks 3-2 OT win against the Devils -- it was really what you want to see from any away team's fan base. 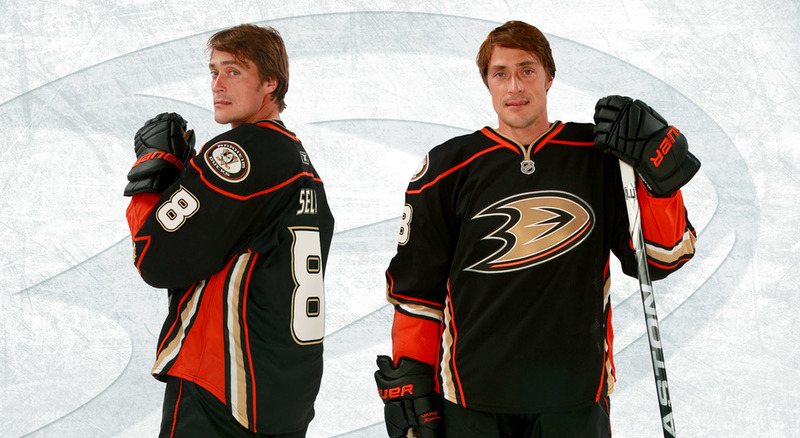 We had a few sightings of our custom third jersey design for the Ducks -- which was completed in 2010 -- the fans don't pull it off quite as well as Teemu, but all get an A+ for effort!